Crazy 800 pounds weight capacity. Accessories are not great. The paddle and pump could be improved. The Tower Xplorer is built to be different. You can feel it, experience it, when you first lay eyes on the board. Standing at 14 feet, the inflatable SUP does have a ‘tower’ing presence. It gives off a vibe that it will be a true beast when unleashed on the water. I couldn’t wait to test another exciting inflatable board. First impressions are critical. They play an important role in determining whether we like a certain thing or not. The Tower Xplorer nails the first impression with near perfection. It glides with ease on the water, and at a good speed too. You will almost forget the size of the board as you zip past the scenery with each paddle stroke. There is a certain ease and comfort the Xplorer provides that comes close to the hardwood boards. One of the reasons the board performs like a pro is its make and structure, which I am going to get into. The Tower Xplorer does give the impression of a tough, fearsome beast, and it certainly has the soul for it as well. Created from some of the toughest military-grade PVC, the board is marketed as nearly indestructible. In fact, all Tower boards carry with them a tag of being tough as nails. I agree with this aspect. But there is another angle to it as well. Inflatable boards need to be made from the best materials because they are filled with air and do not have the luxury of hardwood. And the Xplorer does not disappoint in this regard. Its military-grade material allows the board to survive bumps and bruises without any effect on the surface. 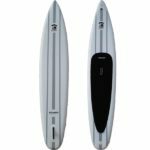 The thermobonded core goes a long way in adding years to the SUP’s life. Bottom line: The Xplorer not only looks like a tough beast, but it is also actually made to be one. The result is that you get a firm platform to glide on, without any fear of the board buckling midway. This may sound like a blanket statement, but the nose of the board can make or break its performance. The Xplorer then has nothing to worry about as it comes with quite an impressionable front. The nose is long, sleek, and has a certain amount of character to it. When you look at it, you know there is something happening here. The front is tapered and lifted up slightly. If you get down to measure it, the nose rocker is nearly 4 inches. In theory, this sets the board up for some speed and some serious performance. But does the Xplorer make good on its performance? The initial tests say so. When you take the board out, it performs with a certain zip that can be missing from some of the other inflatable boards. The board cuts through flat water as if it were cutting through thin air, allowing to travel more and exert less. It can also handle a certain amount of gentle waves, especially those caused on the lake during windy days. Now, this is where the Tower Xplorer truly comes to life. I have mentioned its length earlier in the review. It stands at 14 feet. That itself lends an aura of stability to the SUP. Next up is its thickness. 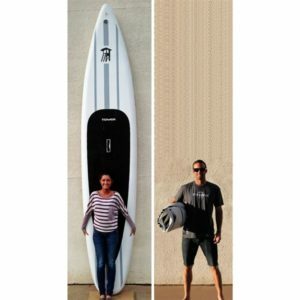 When fully inflated, the board puts eight inches between your feet and the water. This is certainly desirable when the weather gets a bit cold, and you don’t want your feet anywhere near the icy waters. The other practical advantage is that the Xplorer boasts of a stability that is comparable to the hardwood boards. No matter your height and frame, you will never feel the board will tip over. The confidence that it exudes allows you to push harder and faster. The thickness and width of the board adds stability, and it also allows you to have a lot of fun with it. With a weight capacity of 800 pounds, this beast of a board can carry more than one person on board with absolute ease. It can probably carry a family of three and still glide on the water without trouble. Or you can use it as a perfect excuse to get some SUP yoga done on the lake. No matter how much you twist and flex, the board will remain rock steady underneath you. Originally designed to be a racer, the Tower Xplorer carries forward some of its speed genes to make a complete touring board. I have talked about how fast it goes, but it may still surprise you with its speed when you actually take it out for the first time. To enable long hours on the board, you will find a diamond grooved deck pad that feels soft and light under your feet. It eliminates foot fatigue that can creep in when you spend long hours on the board. If you still feel tired you can kneel and paddle. The soft pads won’t hurt your knees one bit. One of the biggest criticisms I have of the board is that it does not have a bungee cord attached to the front. Neither does it have additional D Rings. Both these accessories would have come handy during the long hours you spend on the lake or bay. Additional equipment and food supplies could have been easily carried on board, considering its length and weight bearing capacity. Tower Boards have probably missed a trick here. The other complaint I have, and this is constant with most inflatable SUPs is that the hand pump provided is nowhere as good as it should be. Get an electric pump, and you will be better off for it. The paddle provided is disappointing as well. It’s a bit bulky, and takes some time for the three pieces to align. Invest in another paddle of a superior quality. The Tower Xplorer offers a good touring experience. There are many features and benefits that work for the board. 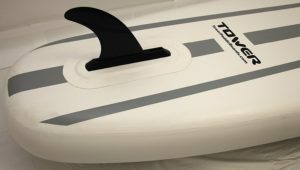 Least I forget, the inflatable SUP comes at an economical price, which probably will attract buyers; especially those looking for a lightweight, compact solution that is easy to maintain. That is the one of the many benefits of the Xplorer. 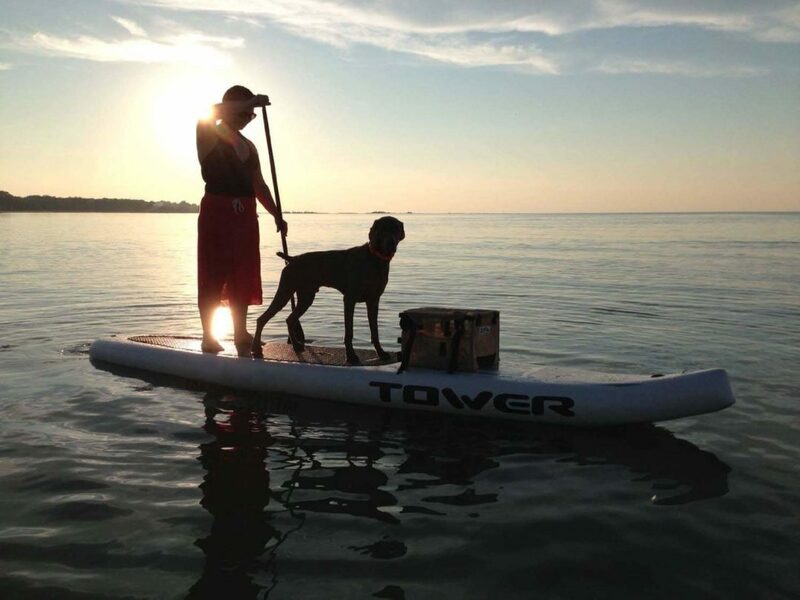 Even though it is tall and thick, the board can be handled easily because of its 36lbs weight. Once deflated, it takes up as much space as a rolled-up sleeping-mat. If you are looking for a board that is equal parts budget and performance, the Tower Xplorer is one of the best options. 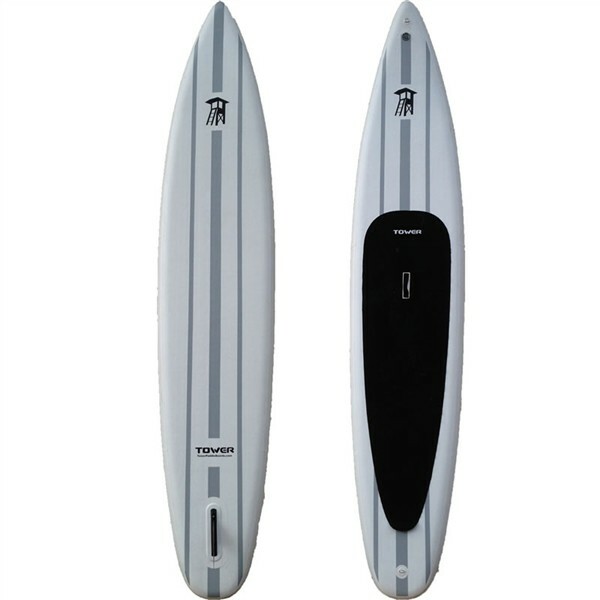 The Tower Xplorer is amazing, I couldn’t agree more that they belong to the economical category for SUP boards. I’m loving your reviews, great Job!